Narrative Style; A mixture of first and third person with extracts from books and articles. Synopsis: Fliss Benson is sent a card with sixteen numbers on it. She has no idea what they mean. On the same day, she is put in charge of a documentary about miscarriages of justice – specifically women who are thought to have killed their children. Then one of the main focuses of the documentary, Helen Yardley, is found murdered and in her pocket is a card very like the one that Fliss received. The premise of this novel was intriguing and emotive. Women who are accused of killing their children often provoke extreme reactions in people and I was curious to see how the subject would be handled. 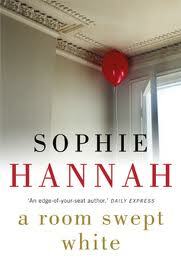 Unfortunately, Hannah allows the narrative to be muddled by too many different narratives and ideas. At first, I thought that the novel would be about Sids and the likelihood of that happening in more than one child from the same family but Hannah throws in high levels of blood salt, babies that appear to have been shaken and babies that reacted adversely to immunisation. To me, this muddied whatever point she was trying to make (and in actual fact, I’m not sure what that point might have been) to the point of incomprehension. Of course, for all this to work, there had to be an evil doctor. Judith Duffy has given evidence in a number of cases and in Helen Yardley’s case claims that it would be virtually impossible for two babies in the same family to have Sids. This was clearly based on the real life doctor who said that the chances were one in 73 million. Of course, as Ben Goldacre has pointed out, this is erroneous and Hannah does quite a good job of showing us why the doctor was wrong. At least, at the beginning. About half way through, she changes tack and we are meant to view Duffy with some sympathy. And we are also supposed to believe that she becomes friends with one of the women that she helped to jail. This stretched my disbelief to the very limit. Perhaps the most annoying element of this novel was Fliss Benson. The only narrator to have annoyed me more is Ana from Fifty Shades of Grey. Fliss is a bundle of insecurities, always doubting herself and bursting into tears. Don’t get me wrong, I don’t believe that all female protagonists should be strong or good role models or anything as crass as that but she really was annoying. I wanted to slap her, I really did. At the beginning of the novel, she is promoted to creative director of the company she works for for no readily apparent reason except that the old creative director Laurie Natrass has found a new job. It is as if Hannah couldn’t imagine a woman being successful except at the whim of a powerful man. Of course, Fliss is in love with Laurie despite the fact that he is exceptionally unloveable which causes a lot of mooning and moaning which I could really have done without. The most successful elements were definitely the third person descriptions of the police investigation and I know I would have enjoyed this more if it had been a straightforward police procedural. And if I’d been convinced by the ending. In fact, I found the last third of the book really difficult to finish. I only did finish it because I wanted the closure even while I knew it was going to annoy me. It is a while since I’ve been so relieved to finish a book.